It’s five years to the day since this Kaitness Hoosie design was created. Part of me feels it should’ve been on the sale rack long before now but like so many Caithnessians, I feel strongly connected to the poem so just can’t bring myself to let go. I’ve got fond childhood memories of Mrs Baikie to thank for that. Mrs Baikie was a granny figure to my mum, so I guess a great-granny figure to my brother and I. We’d visit her wee hoosie in Pulteneytown from where Mrs Baikie would send us bairns “over til eh shoppie wi a liney” with the promise of a nip of her home brewed ginger wine as our reward... delish. She was as coothie as Kaitness wifies come and would often recite John Horne’s poem ‘Div Ye Mind?’ by the fireside. I can still hear the crackling coal and Mrs Baikie’s soft voice reciting the dialect, determined to remember every word before ending with a proud smile. Fifteen years later, I carried the poem in my backpack while traveling as a reminder of my Caithness roots. 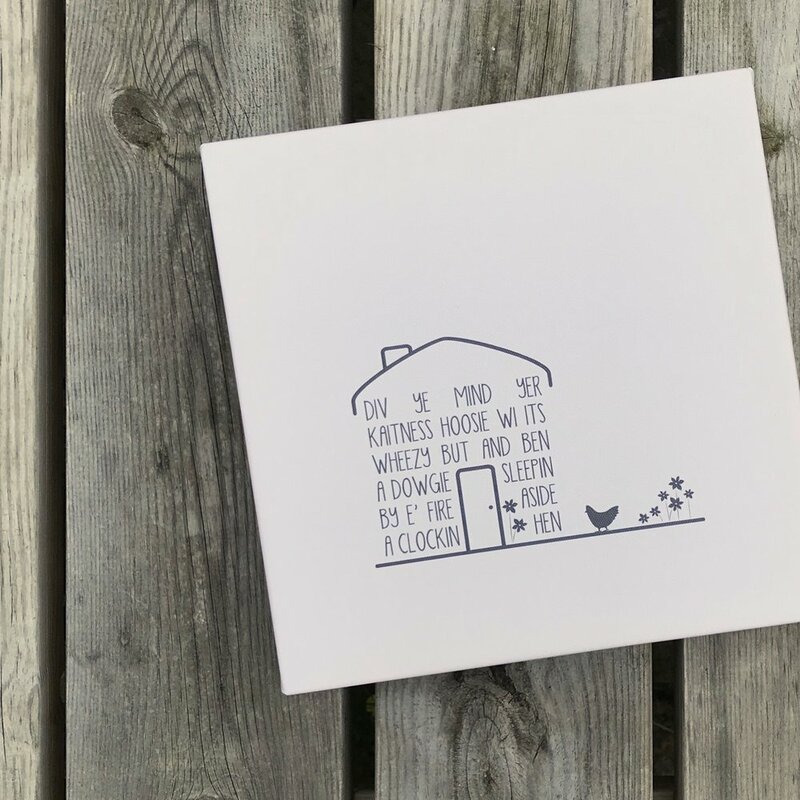 And today, the first two lines feature on one of my bestselling designs with owners of canvases, cushions and cards near and far - almost as humbling as the poem itself and those cherished memories of Mrs Baikie. A cowgie fu o sooans, an’ a stoolie wi’ a list? Div ye mind, boy Eh? Div ye mind? An e’ chuckens fechtin roond ye for e’ sweelans o’ e’ moogs? Fa’s clubs wis bandaged kail-runs or anything at hand? An e’ linin o’ a pockad wis pit roond it wi’ a straw. An e’ blinkin faces roond ye, tryan hard til look intent? An ye cut initials in e’ pew fan “Thirdly” shut his een. And ye tumbled in a burnie, and skelpt aboot til dry? Far fae hoosie, kirk and burnie, in e’ world til act yir pairt? An vowed til play e’ man and bring them no disgrace?